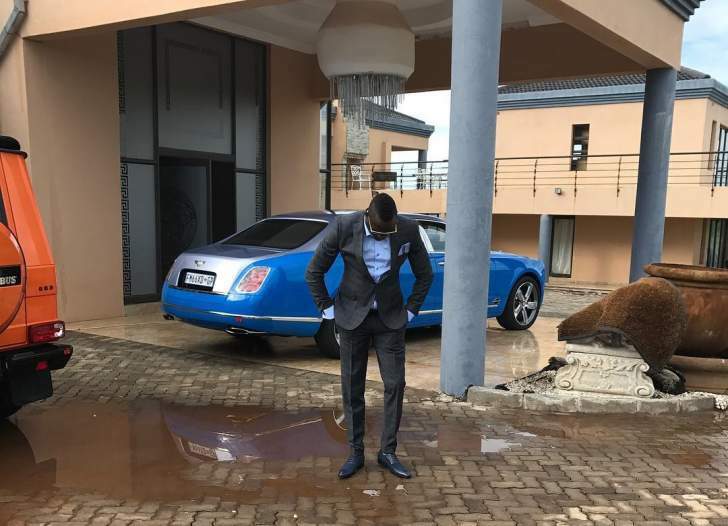 Socialite ''nouveau riche'' Genius ''Ginimbi'' Kadungure is really not an interesting character, at face value at least. His face is just about as interesting as sitting down and watching paint dry. Or reading a 1968 edition of the Telephone Directory from Czechoslovakia backwards. Or spending the afternoon with former vice president Phelekezela Mphoko. Or . . . you get the picture! If Genius stands there in front of you, he would look as useful as an appendix. Not known use. But when he opens his mouth, he can spark a social media war and a great deal of debate and discussion. And that is probably why they called him Genius. He IS a genius at making himself relevant with even sometimes the most infantile of things. And some may write him off at their own peril over sideshow issues. Some may be dumbstruck by his English accent which is pretty heavy and tends to waddle like a duck, distracting many from what he will be saying. It is not a pretty accent. Others may just be distracted by his waddle of a walk and dismiss what he has to say. But for those with the patience to look beyond the simple distractions (after all he is not some European chap or a privileged kid educated at St Johns - you know, that St Johns that has been in the media a lot, but we digress) what he says has the power to make people either cringe and shudder or marvel at his vagabond to king turnaround. The boy from Domboshava And he was at it again. While many were looking at the United Nations for earth changing developments, a video Genius posted while he was booked at the Waldorf Astoria in the United States got the attention of even some of the most serious social commentators in the nation albeit for varying reasons. Walking through a minefield of English pronunciations and lardy words and an accent that could leave one's ears bleeding from irritation, Genius was in fact celebrating his wealth and flaunting how he could check in to a reasonably expensive room he had booked in Beverly Hills. He was also celebrating how he is just "the man" for managing to afford such a holiday for himself before declaring his intention to hop out for (presumably an expensive) lunch. A lot had happened in that week amongst especially those with little to do. Gate-crashers to weddings with no intimate knowledge of the bride and groom would pass the time talking about the struggles in the AFM church regardless of the fact that they know nothing about that church or religion in general simply because the papers had started conversation. Losers at funerals with no knowledge of the corpse would huddle together waiting for free sadza and beef bones as they discussed hypothetical stories of sexual orientation, which was suddenly an issue in this past week. Who is dating who? And thanks to Dr Neal Hovelmeier, the bedroom became a wide open arena for speculative discussion. Yet in a week with enough to speculate about, enter Genius, who had been forgotten for a while and he started stealing the limelight. Many were not impressed because Genius had been cast as a person close to people in authority, and his name dropping of authoritative figures meant that by default the reputation of the nation would be ridiculed if associated to what people saw as a daft celebrant of dubious wealth. Responding on a thread, key people thought the flaunting of wealth was backward, especially by Genius, whom they saw as a bad example to the youth who had to learn the tenets of hard work, energy and tireless dedication as opposed to seemingly easy money. "I'm embarrassed for him," said socialite, businesswoman and politician Josey Mahachi succinctly without mincing her words. "So sad seriously, not sure if this is at all necessary. Yes he might be a rich young man but these behaviours make other people, races look down upon us. No class at all," added one observer Amnos Gapukapu Businesswoman and role model Divine Ndhlukula was also unimpressed: "There is everything wrong with this video. He is displaying his ignorance and stupidity. For a start, he is waffling as he even can't express himself in English." "He could have used Shona and there is nothing special about the standard room he is showcasing. Thirdly, what's inspirational about being in hotel room - expensive or cheap. I would have expected he talks about what young aspiring entrepreneurs could learn and take a leaf out of what he does. More concerning is he is seen in the company of key decision makers and that can invoke a whole lot of questions on the VIPs. I do often state him to my kids as the least person to learn anything from," she added. Yet others were understanding of Genius' latest trick. Themba Kumbula came to his defence; "Why do we want to learn pese pese seiko vanhu musinga gone kufara, this video is not educational or political it's 'Ginimbi achidya mari yake' and he shares it to his fans." At the end of it all, while he had been in the limelight for all the wrong reasons, what with the Wicknell-Genius fraud allegations in court, he managed to distract the public from important issues and have them start talking about a video he made, how expensive the hotel really was, and what an atrocious job his English teacher did on him and how he needs to go back to his English teacher and demand a refund. Genius, in his inherent Genius, knows one thing; there is one thing worse than being talked about whether at a wedding or funeral; it is not being talked about. So whether they are spreading smear or bad mouthing you, the fact that they are talking about you and yet are too boring to be talked about themselves means they are sad and sore boring square creatures. Genius if not square if this renewed interest in him is anything to go by. But for a man like him, who has been burnt enough, buried, dispatched, declared dead and never to rise again, Genius has shown that you can never put someone down who has a destiny to shake the foundations of his society. Whether for good or bad treasons, Genius has won the publicity war by making sure that he stays in the headlines. But to the credit of observers, perhaps just as Wicknell was "shut out" from splurging at Miss Zimbabwe, perhaps the nouveau riche should be allowed nowhere near respectable sections of civil society.